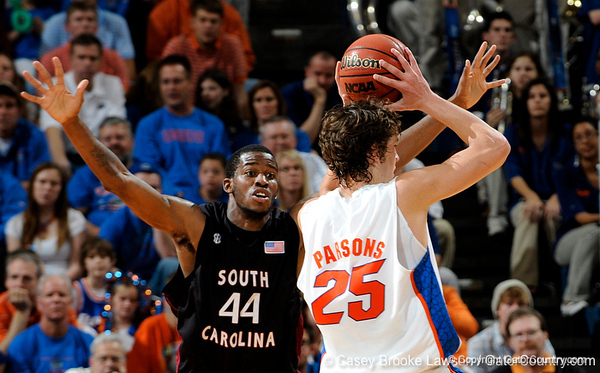 Florida junior Chandler Parsons hit a three-pointer at the buzzer, his second game-winning shot in three weeks, as Florida (14-5, 3-2 SEC) defeated South Carolina (11-8, 2-3 SEC), 58-56, Saturday night at the Stephen C. O’Connell Center. Parsons finished with 10 points and 10 rebounds on the way to his fourth career double-double, his second this season. Parsons missed his first three treys, but hit the only one that mattered after an assist from sophomore guard Erving Walker. Walker additionally scored in double-digits with 13 points, while freshman Kenny Boynton chipped in 14 and junior Alex Tyus contributed 12. Devan Downey led the Gamecocks with 36 points, one shy of his career high. Downey spun out of a double team and hit a short jumper to put South Carolina ahead, 56-55, with 5.1 seconds remaining. Walker then dribbled to the foul line and hit Parsons with a perfect pass. Parsons got both feet under him and stroked the three from the left wing. A similar celebration unfolded Jan. 3 at North Carolina State, when Parsons hit a 70-footer at the buzzer to lift Florida to a 62-61 victory.